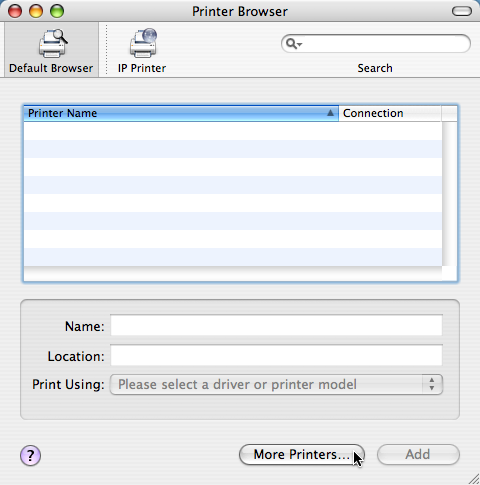 How to print from a wireless Apple MacBook running OS X 10.4 (Tiger) to a shared printer on a Windows XP computer. 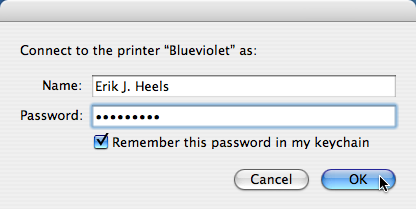 It’s hard to share printers on a network. Always has been, always will be. Of course, it should not be this way. Computers should be easy to use, and they have gotten easier through the years, but it puzzles me that something so simple is still so difficult. You have a printer, perhaps an older printer. Said printer is connected to your Windows XP computer. You have given said computer a short name with no spaces and shared it. Other Windows computers on you network can happily print to it. You have a Mac. Perhaps connected to your network wirelessly. Perhaps you don’t like lugging a laser printer in your computer bag. Perhaps you don’t want a printer in every room in your house. Or cables strewn across the floor. So you have decided to try to print to the shared printer. You are completely insane. OK, maybe not completely insane. Maybe Apple is insane. Maybe it’s Microsoft. In any event, you think this will be easy. Bwah hah hah! Wrong. You Google for answers, disappointed at the shreds of information here and there that provide only pieces to the puzzle. Then you find this article. Your problems are solved. 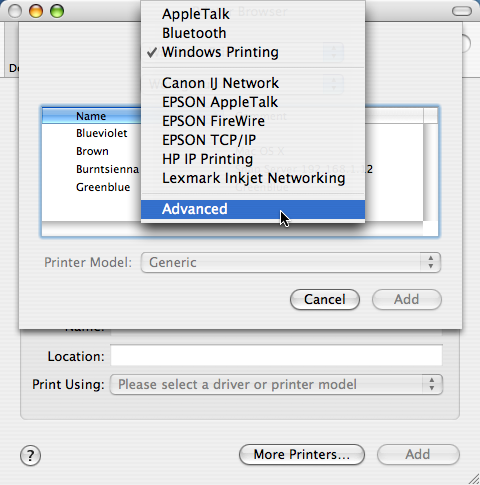 From the first pop-up menu, select the “Windows Printing” option. From the second pop-up menu, select the “Workgroup” option (or whatever you have named your Windows workgroup). As you may know, OS X doesn’t always play nicely with workgroups that are not named “WORKGROUP.” Ain’t networking grand? Next, select the computer with the shared printer attached to it and click the “Choose” button. You will be prompted (ironically) for a username and password. Enter those, optionally check the “Remember this password in my keychain” option, and click the “OK” button. You’ll likely get an error message that says “Unable to connect to server with the provided password and user name.” that is labeled “Error: 256”. (Isn’t “username” one word?) Note the lack of helpful information in this error message. Do you know what error 256 is? I sure don’t. Hmm. Now comes the magic, silly, undocumented, user-hostile trick that you were supposed to just guess. I added a sticky note to my screen to capture the beauty of this trick. Here it is. Go back to the Printer Browser window. You have to option-click on the “More Printers” button to get the (usually hidden) “Advanced” menu in the next screen. Now why didn’t I think of that? From the first pop-up menu, select the (now unhidden) “Advanced” option. 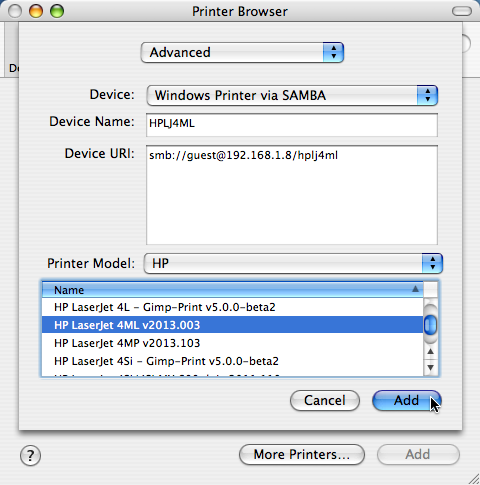 For the Device option, select “Windows Printer via SAMBA.” For the Device Name option, select the name of the shared printer (no spaces, and there is probably a maximum number of characters, like 8 or something, but I’m not sure). For the “Device URI” option, select an address of the form “smb://guest@192.168.1.8/hplj4ml” where “192.168.1.8” is the IP address of the Windows computer with the shared printer and “hplj4ml” is the name of the shared printer. 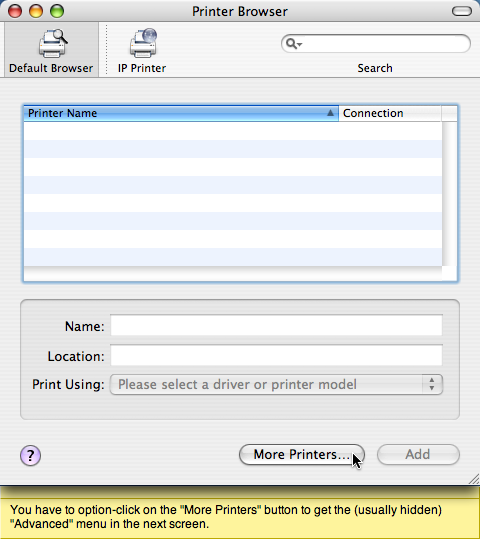 From the Printer Model pop-up menu, select your printer manufacturer (this menu should be called “Manufacturer Name” menu). 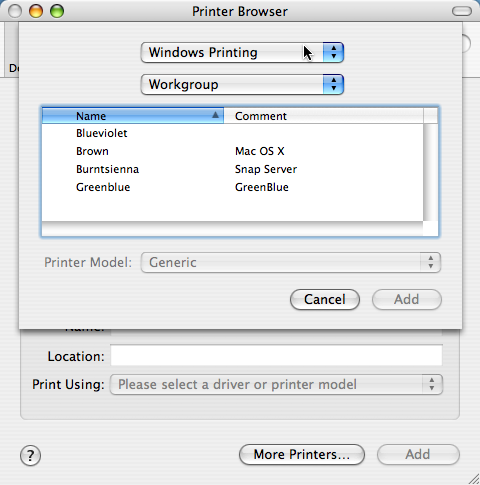 From the Name windows, select the printer model (this window should be called the “Printer Model” menu). Then click the “Add” button. Now you’ll be able to print from your OS X computer to a shared printer on a Windows XP computer. But, honestly, this should be a lot easier. 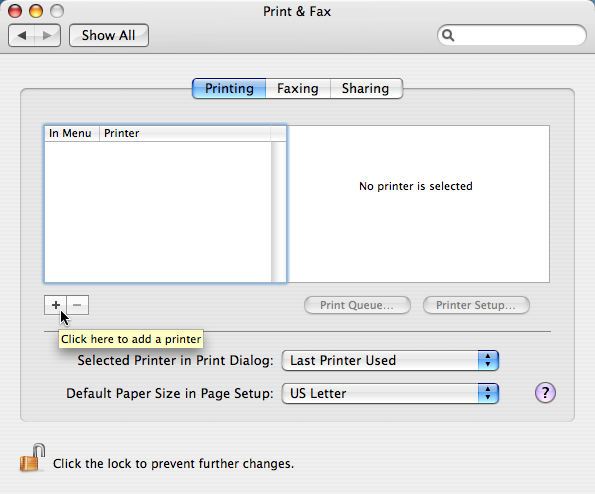 Attached shared printers should just be discovered by OS X, and advanced options should not be hidden by default. Memo to Apple: fix this. Apple computers are supposed to be easy to use. Thanks! Just got the latest Mac Mini and was having a devil of a time trying to print. This should be easier out of the box. Are you listening, Apple? I am on an Active Directory domain, and was experiencing this problem. If you configure a Mac to bind to an AD domain via Directory Access, make sure you also configure SMB/CIFS to point to a WINS server in the domain. Doing this eliminated the need to go through the ‘Advanced’ Printer Setup utility. 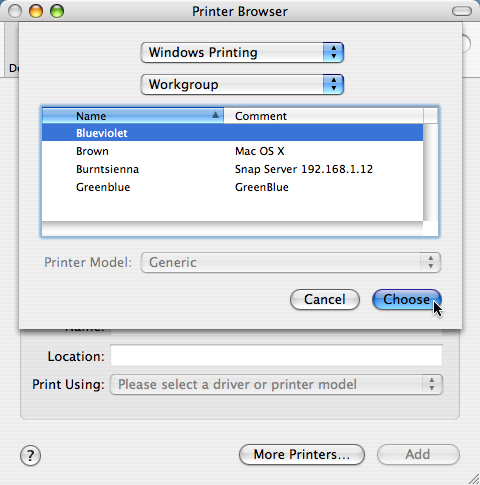 I was able to browse to and successfully add/install the printer(s) of my choice on my Mac. It still did prompt for username and password, but now it actually authenticated properly, and all is well! No more Error 256! Of course, if you are on a small workgroup network without AD, then this does not apply. You are my hero! I bought a new Macbook a few weeks ago and have been going CRAZY trying to figure out how to print to the printer attached to our home server. It was EXACTLY the scenario you had the the beginning of the article. I changed the name of the workgroup on the server to WORKGROUP, followed your instructions and everything worked perfectly. Thank you SO much. It seems the site munched my URL: trying again. Firstly, thanks for the tip! The only problem with this is there is no way to just edit the URI quickly after it has been created, so if your forced domain password change comes, you have to re-create the printer. that’s a neat trick….but here’s a question: what do i do if i want to share a printer that’s attached to a XP computer that’s on a wired LAN that dynamically assigns IP addresses? The IP address of the computer hosting the printer will be changing, yes? ahhhhhhhhhhhhhh!!! you are a god. thank you so much! You’re a gentleman and a saint. As a technology professional I do expect to be paid for my time and knowledge. But I’m always willing to share for free this kind of advice. It helps us all by allowing us to continue using the technology before us and moving forward. This solution was available on another site, which ranks higher in Google, but only for a monthly member ship. They’re called the experts exchange, and I’m glad I didn’t need to cough up change to hook up my printer. Thats a great trick.. I had the exactly same problem. A trick might be to hold down the command key, while pressing “more printers” that showed the “advanced” option right away.